Oh man what stunning polish!! Get out those drool napkins for this one, kids! Feast your eyes on the delight that is CrowsToes Betelgeuse! Betelgeuse is described as "dark ultramarine/aqua blue based multichrome that shifts through a range of magenta purple to coppers to greens packed with an over the top mix of multichrome flakey madness with a bit of spark added for fun". The base is kind of a smoky blue that turns purple and hot pink depending on the light. Then the flakies come in to play, adding a multitude of other colors, including a gorgeous strong green flash. 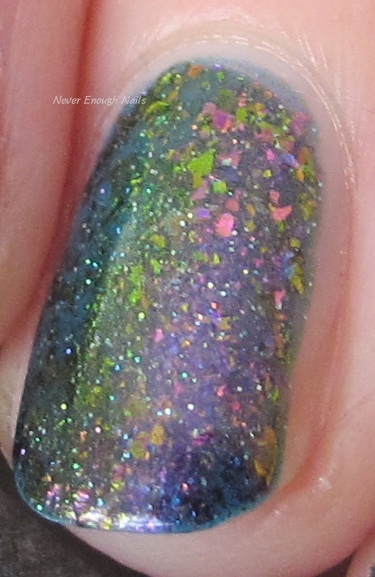 On top of all of that, there is a dusting of holo sparkles! Such an amazing polish! This is three thin coats. It could be opaque in two, depending on your application. The formula was very good, pretty easy to apply despite the complexity of the polish. Having the multichrome base really makes this more opaque overall, rather than just having a lot of flakies in a clear base. I think that's why this polish packs such a shifty punch! I love that CrowsToes polishes are never sold out or impossible to get. Lauri pretty much keeps things available for as long as there is a demand and I think that's amazing. That means you can go get Betelgeuse! It's on the site now, but the shop is only going to be open on weekends right now. So this weekend, head on over to http://crowstoesnailcolor.bigcartel.com and grab yourself some Betelgeuse!